With GeoShred Play, everyone can shred using the the new diatonic playing surface! You can Shred the Blues and never hit a wrong note. Slide your finger in any direction and let the magic happen using a scale that fits perfectly against a backing track. Seamlessly move between fretless and diatonic modalities in a magical musical way using our isomorphic and diatonic playing surface and groundbreaking intelligent pitch rounding. 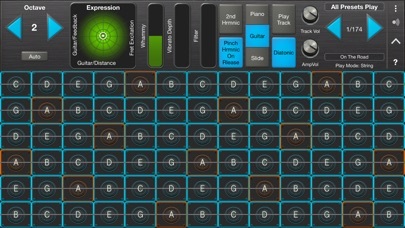 GeoShred Play is a play-only version of the award-winning GeoShred musical instrument for iPad, iPhone and iPod touch. GeoShred Play can be used to perform GeoShred Pro presets. It's a great way to get started with GeoShred, AND it can be upgraded to ALL of the powerful GeoShred Pro features like preset editing, AUv3 plugin support, MIDI/MPE and setlist editing. A winner of a 2019 Guthman New Musical Instrument Award, and a winner of the 2017 Electronic Musician Editor's Choice Award as "one of the most innovative, groundbreaking products to emerge in the past twelve months". GeoShred’s performance surface with “almost magic” pitch rounding algorithms is coupled with a model of the physics of strings. It’s a fusion of Jordan Rudess’ performance concepts and moForte’s powerful, modeled guitar/effects based on the Physical Modeling research of Dr. Julius O. Smith III of Stanford/CCRMA. GeoShred Play Features Include: • A fluidly expressive playing surface + a Physically modeled guitar • A diatonic keyboard where every key on the screen is in the scale. • Support for backing tracks • 3D touch on devices that support 3D touch. 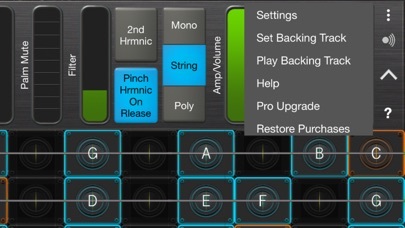 • Inter-App Audio and Audiobus support. Praise for GeoShred “GeoShred is brilliant- it’s a real instrument.” – Eddie Jobson “A fantastic new invention which is going to revolutionize the way music is played, expressed and learned! “GeoShred” is one of the foremost best musical inventions I’ve had the pleasure to experience in recent years. Definitely 5 stars out of 5! GIGANTASTIVISSIMO…..R…A…Z !!!! !” – Patrick Moraz “That’s just nuts. You’re [Jordan] the best-guitarist-without-a-guitar of all time” – Joe Satriani “GeoShred is a breakthrough [musical instrument] for the iPad. Some might think it’s the best evidence yet that there has indeed been reverse engineering of alien technology, but if that’s the case, then aliens play guitar…and worship Jimi Hendrix.” – Craig Anderton Harmony Central “Geoshred is a completely innovative music instrument that has become an essential tool for me in both worlds; on stage and in the studio. The quality, flexibility, expressibility and reliability of Geoshred have made it my go-to (and admittedly most used) iOS music app!” – Diego Tejeida, Haken Though it’s not possible for us to respond to support issues posted in iTunes reviews, we are committed to a great support experience for our users. Please consider contacting us at support@moforte.com so that we may directly assist you. 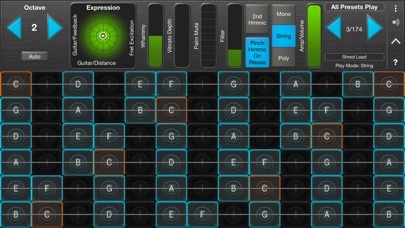 Note that GeoShred Play does NOT include MIDI/MPE, Preset editing and setlist editing. GeoShred Play can be upgraded to include all the GeoShred Pro features via an in-app purchase. We are dedicated to offering the highest level musical instrument experience for our customers worldwide. It would mean a lot to us if you could leave your positive review on the App Store and If you have any questions about GeoShred we would love to hear from you at our support email address: support@moforte.com We welcome your thoughts and feedback and if you find a bug we will squash it! Minimium Requirements: iPad2, iPhone 4s, iOS 9.3 or better. If upgraded to GeoShred Pro for AUv3 support iOS 11.4 or greater is required. I recently upgraded my geoshred play to pro version by paying the extra $14.99. But I still see the same blue icon. How would I know that it got upgraded? I love shredding the blues! I love shredding the blues! They have this new kind of keyboard where you can’t play any bad notes. That combined with the blues backing track is amazing. I can play the blues just by moving my finger around. My elementary school daughter is able to totally rock the blues!